The purpose of St. Anne Guild is to serve God through a greater commitment, to realize the joy that comes in direct proportion to knowing Him, and to unite the members through prayer, work, and mutual support, making Saint Anne a beacon of love and commitment. St. Anne Guild is open to any woman who is a registered member of Saint Anne Catholic Church, or who is the wife of a registered member, and who wishes to contribute and participate through her ideas, support and prayers. Three women talked and listened and talked more. It was 1982. Father Jim Rent was pastor, and there was an expressed need among the women of Saint Anne parish to connect with one another in prayer, to serve God through service to the church, and to build a network of friendship and support among fellow Catholics. Poppy Doyle, JoAnn Edmundson, and Joan O'Leary called on 33 ladies of the parish to meet in September 1983 to become a steering committee. The proposal was to form the St. Anne Guild. The goals were simple: to pray and work together and strive to make Saint Anne a beautiful, spiritual, and friendly church. The targets for work to be done were many. The need to extend the wonderful spirit of warmth, hope, love and commitment to more parishioners was very real. After several planning meetings, the Guild was officially launched in the spring of 1984. The workers were tireless, extending hospitality and help at the most joyful and the saddest times – weddings, baptisms and funerals; they cleaned, planted, did fund raising to further the work of the Guild and the church. Each task assumed, was accomplished. Now over 35 years old, steady growth has occurred in God's service. 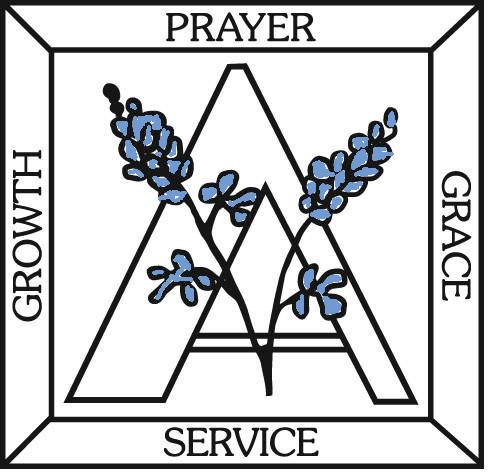 The members, more than 200 strong, through prayer and work, have achieved grace and growth, and the Guild has become a beacon of love and commitment. Building and Grounds: Perfect for someone who cannot commit to a monthly project or ongoing responsibility. This committee cleans the Bride's Room and sanctuary of the church twice a year, during Advent and during Lent, usually on a weekday morning. Community Service: You'll see the Spirit in action if you join the Community Service Committee! The committee organizes the Guild's support of the Christian Community Services Center (CCSC) including Back to School, Jingle Bell Express and Azalea Dinner as well as Amazing Place, Ronald McDonald at TCH and the monthly parish food drive. The committee may also evaluate other community service opportunities for the Guild's consideration throughout the year. Corporal Works of Mercy: Perfect for someone who is available on weekdays and on short notice. A large pool of members is required, since not everyone is available when needed. The members assist at Funeral Masses for the parish. Historian: The Historian records the Guild year in photographs, taking photos at meeting and parties. Photos are posted on the web site, shared with members, included in the Newsletter Chair and used to chronicle the Guild Year. This is a small committee that looks for people that like to work with photography and capture the essence of our gatherings. Hospitality: This committee provides the daytime luncheons and evening dinners for our monthly meetings. Members can sign up for the month of their choice and help cook, set tables, serve and clean up. This committee offers a great way to get to know other ladies in the Guild. Martha: The Martha Committee is the companion committee to the Corporal Works of Mercy. Members are needed who are available on short notice. We host receptions following funerals for family of Guild members or any member of the parish who requests our help. We set up for the reception, serve the needs of the family and clean up following the event. Most of the receptions are catered by the family. Membership: A perfect way to get to know everyone in the Guild. Help by greeting the members at the door at our monthly meetings and making them feel welcome; checking in members at the arrival desk and giving them their name tags. This committee is responsible keeping the membership roster up to date, making new members feel welcomed including interviewing new members for the newsletter, conducting the membership drive, and receiving dues. Newsletter: The Newsletter Committee ensures that the St. Anne Guild Newsletter reports informative, timely and accurate material that is of value to the organization and its members from September through May of each Guild year. The Committee Chair(s) develops and edits the newsletter contents, and the Committee members provide assistance with collection of the material, proofreading and printing/distribution of the monthly paper copies. This committee is a good fit for Guild members who enjoy reporting on the special events, volunteer efforts and items of interest for each month’s issue. Spiritual Life: If you want to help in sustaining and growing in our prayer life as a Guild member, this committee is for you. We plan the Advent and Lenten Days of Prayer; write reviews for the newsletter of a spiritual book we have read; keep up the Guild Book of Prayer; and choose prayers for each meeting. Telephone: If you have a phone, you’re needed. This committee provides a great service by updating members not on email with the late-breaking events, meeting information, and the Guild prayer chain. The more members on the committee, the fewer calls each person has to make – usually three or four calls per person, a couple of times a month. Ways and Means: This committee needs a variety of talents as it plans and implements Guild fund-raising activities. Whether you can sign up for ongoing work like publicity and planning or help with set up and work at events, you are needed. Wedding Assistance: Not available weekdays? Then this is the committee for you! All weddings have Friday evening rehearsals and Saturday weddings and you’ll only have a wedding every 4-6 weeks! Weddings at Saint Anne are such beautiful events, but they need our help to come off without a hitch. While minimal training, you’ll lean to conduct a rehearsal and a wedding and share in the joy of a couple’s special day. Held on the second Wednesday of each month from September through November and from January through May. Daytime meetings gather at 10:30 a.m. with the meeting beginning at 11 a.m. Luncheon follows the meeting. Evening meetings gather at 6 p.m. with the meeting beginning at 6:30 p.m. A light-dinner follows the meeting. The Guild sponsors at least one Day of Prayer usually during Advent and/or Lent with and outside retreat speaker. The Guild Christmas party is held in early December and is a dinner for members and guests held in the St. Anne Parish Center. The Ways and Means Committee of the Guild is responsible for planning and implementing the fund raising activities for the Guild. Some examples of activities have been a Games Day and Party Signup events. The funds raised have been used: to fund Pastor special projects; contribute to Saint Anne Church capital campaign; to fund materials for Saint Anne Church Archive committee; to remodel the Bride's Room; to fund the chapel in the new rectory; to donate the tapestry of Saint Anne hanging in the church; to establish an annual Scholarship for Service Fund for a seventh grade girl at St. Anne's School; to donate the church bells in the bell tower; to restore, refurbish, and furnish various rooms and buildings at the church and school.